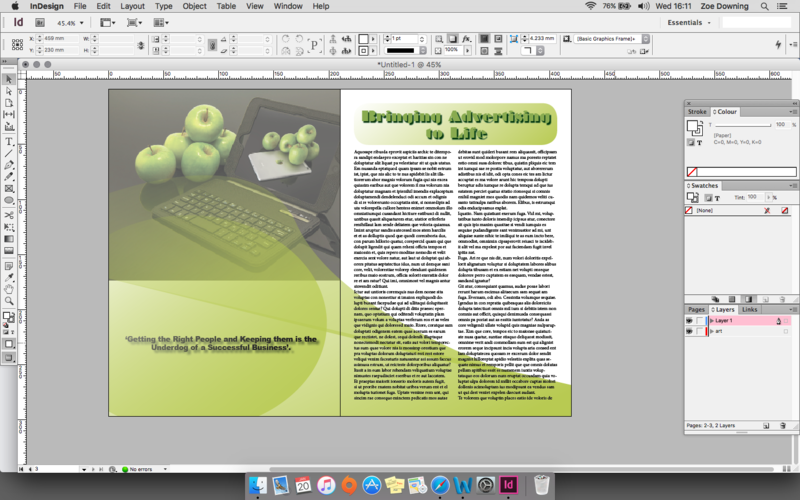 Business Boost with InDesign: Why take up a Course? Forget everything you know about paint or word. 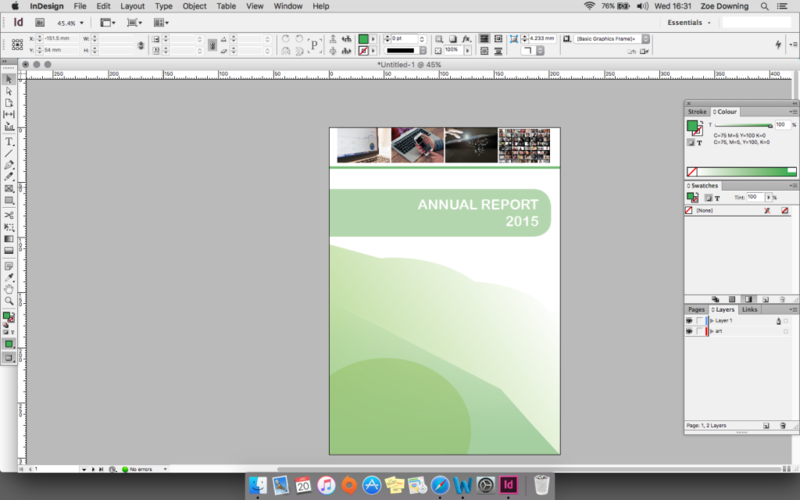 Using InDesign for your business has so many more benefits including appearing far more professional. I have put this article together to give you an idea of just how handy and creative this initiative program really is. Digital marketing is rife in the industry and by cultivating this, you can really open up a whole world of business opportunities, and the recognition you’re looking for. There are a lot of great free resources out there for creating graphics for your blog or business, and these can be a good avenue for beginners. But as your business grows and matures, there comes a time when professional design software will be the next step. An example, you’re an interior designer however when you reach the clients house, you turn up with some PVA glue and some feathers. It’s not really the impression you want to give and certainly does not. Using professional design will instill faith in your business and clients are more likely to trust your expertise. Most importantly when running a business is thinking about branding. This is how you sell yourself. Design is so important to bring customers in and create the right impression. You want to be at the top of Google? Start with design, and hone your brand. InDesign is a great tool to help you do this. With the various features and fonts, colours and tools, you can create great logos and other prints look top of the game. Using word-art is just not going to cut it and look rather unprofessional, instead, using InDesign you can create drop shadows and beveling, giving a sleek and professional look to your text. InDesign was created for the intention of producing better print quality, sharp text and the ability to easily convert your documents to beautiful pdf formats, as well as being able to make business cards and other documents I have already listed. It is both used for online publishing as well as offline. Text and images look phenomenal. It is also possible to collaborate InDesign with other Adobe programmes such as Photoshop and Illustrator to really introduce your creative sparkle. Inserting images, creating shapes and using colour is so easy and aids your creativity instead of consuming your time. There are a whole array of tools and features such as the pen tool to create interesting shapes and paths, create multiple pages in the same document and flick through each page using the pages panel. You can also create a master page to duplicate the template on the multiple pages you may be creating. Text is easy to move around the page and organise and an array of features help to create the specific look of the text you wish. InDesign’s professional look never ceases to amaze me, with it’s clear lines and beautiful designs the possibilities are endless. InDesign accepts a wide variety of file types as links including the common PSD, AI, JPG, GIF, TIFF, PDF, PNG, and EPS. There are various graphical, and productive documents to create in InDesign such as e-books, flyers/brochures, magazines, thank you cards, business cards, pricing guides, schedules, business plans, staff docs, checklists etc. The list goes on, and to put cherry on top of the cake, they are your completely unique and creative designs. By taking up a course you can really stand out from the crowd and bring in more business. Create professional looking documents such as email signatures, invoices, quotes and training guides. When looking at Adobe programs it may all look very intimidating, however, the courses designed are easy to follow and with our online InDesign training course videos, you will learn how to master the full power of this industry standard page layout programme. In no time you will be creating stunning newsletters, brochures and posters. It doesn’t stop there though, after you have grasped the fundamentals we then move you on to learning all the fantastic interactive elements that you can add to your PDFs for online use. Interested in taking up a course today? If you wish to speak to a member of the team we can be contacted on 01332 986924. You can also email us directly on info@creativestudiosderby.co.uk.